Reuben Archer Torrey (1856 - 1928) was an American evangelist, pastor, educator, and writer. Charles McCallon Alexander (1867 - 1920) was an American gospel singer. 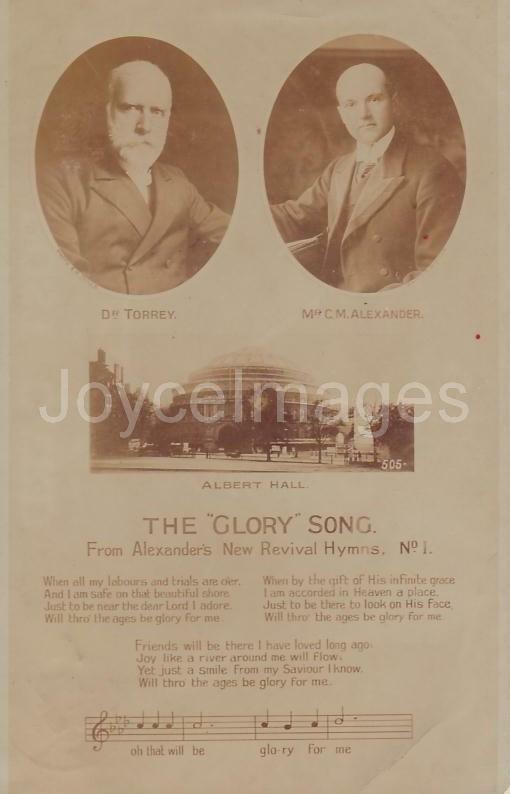 Torrey conducted worldwide evangelical campaigns between 1902 and 1906 with Charles Alexander as his song leader and Robert Harkness at the piano. The 1902 - 1903 tour included England, Scotland, Ireland, Australia, New Zealand, China, Japan, and India. The 1903 - 1905 tour revisited many of the previous cities, with a five-month mission in London. This PC is from London (1903).